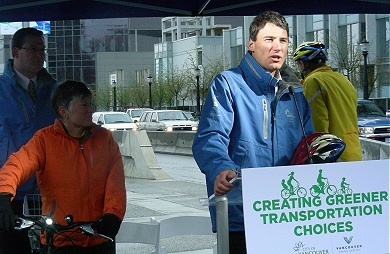 Today in morning rain drizzle, City of Vancouver Mayor Gregor Robertson led an enthusiastic group of over 25 cyclists on a ride across the Dunsmuir Viaduct separated bike lane to mark its official opening. However over a week earlier, cyclists were already enthusiastically using it. 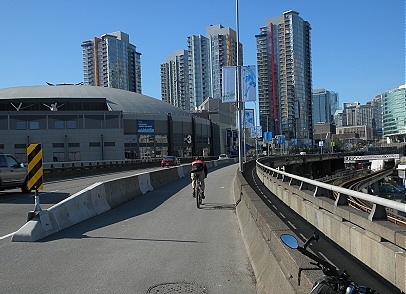 The Dunsmuir Viaduct bike lane is a good example of a separated bike lane that was mentioned in the University of British Columbia study, Cycling in Cities. The study points out in order for Vancouver to significantly increase its mode share of cycling for transportation, there needs to be more separated bike lanes where cyclists of all ages feel safer. It was low-cost, low-effort opportunity for the City of Vancouver to create the Dunsmuir Viaduct lane. The city had been testing the traffic road capacity by reducing car lanes from 3 to 2 lanes during the last 5 years. Road lane reduction was necessary for construction of an adjacent highrise condominium-Costco store complex. Already car drivers had time to adjust travel routes. Already concrete blocks were there to create the bike lane barrier. We welcome this most recent feeder route into the city’s cycling infrastructure network quickly on the heels of the Olympic Games. During the Olympics, there was massive proof of thousands of people adjusting to alternative transportation to reduce car traffic congestion. During Robertson’s remarks for the press and public outside Stadium Station, there was a stream of incoming cyclists on Dunsmuir. The Dunsmuir Viaduct bike route will become popular since it is a faster, direct and uninterupted bikeway into downtown. Unfortunately the morning’s announcement and event was marred by a cyclist accident that someone witnessed at Penticton St. today. Also Councillor Geoff Meggs, a cycling champion, sustained a spine injury in a cycling accident yesterday morning during his bike ride in south Vancouver when a car ran into his unprotected bike lane. Councillor Meggs was unable to attend today’s opening. We all wish him a speedy recovery. Becker, Jack. Vancouver Moving Towards Separated Bike Lanes. Feb. 2, 2010. CBC News- British Columbia. 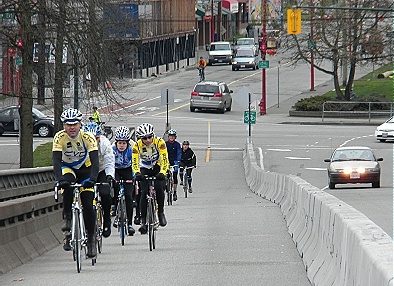 “Vancouver Opens Viaduct Bike Lane. Cycling Councillor Hit by Car One Day Before Opening.” Mar. 10, 2010. Video on Robertson’s speech. Howell, Mike. “Bike lane champion on council in hospital after collision with car”. In Vancouver Courier. Mar. 10, 2010. Huh, I need to take photos of a similar facility we have in Santa Cruz CA – using K rails like this.